Ever so often our local grocery store has a special on whole fryer chickens and I like to grab two or three. I used to put them into the freezer, but I never remembered to drag them out in time to thaw. Now I’ve started baking and shredding them as soon as I get home from the store. They really are the best when I have time to leave them in the crockpot all day and let them cook slowly, but they’re still delicious after a few hours in the oven. I store the shredded chicken in the freezer until I’m ready to use it. The shredded chicken thaws SO much faster than a whole chicken! I recently made Chicken Alfredo Spaghetti Squash Boats and had some shredded chicken left over. Since I’m always trying to find new things for lunches, I thought I’d give chicken salad a try. I am really pleased with how this recipe turned out. I used the Blue Owl’s Crunchy Chicken Salad recipe for inspiration (I am so completely addicted to it! ), but made a couple of my own additions. I started with Wildtree’s Dill Dip (sour cream, mayonnaise & dill dip blend), I’m not sure that the sour cream added a whole lot to the flavor. I really enjoy the combo on the Dill-icious Chicken Bites, but here I think it would be fine to go with just mayo and skip the sour cream all together. I also added the dried cranberries (Blue Owl uses pickle relish). Don’t skip the lemon juice…. it just adds the perfect little bite…. or the pecans… they add a little crunchy texture. Use the bib lettuce like a tortilla to roll the chicken salad up. When I tell people that I’m Gluten Free I often get this look… like they just know that all I eat is tofu and bean sprouts. Just this morning one of my friends told me “Oh, my family would never eat that stuff.” Um…. What “stuff” do you think I’m eating?! Seriously people! It’s not bad…. actually, unless you know that I’m Gluten Free….. you probably wouldn’t realize that I’d fed you a gluten free meal. I don’t like to use a bunch of weird ingredients to replace flour… for the most part I just don’t make things that call for flour. 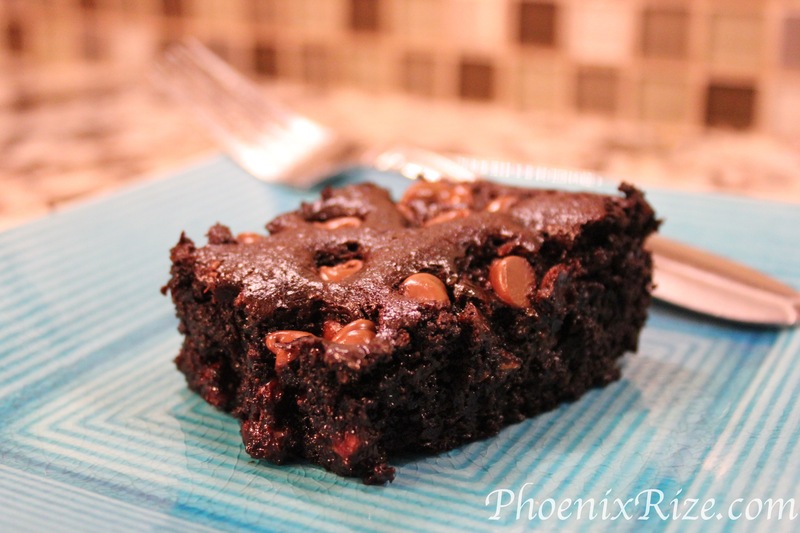 There are plenty of other recipes out there that don’t require flour at all…. and really, the recipes that call for flour are usually high calorie, high carb…. bad for you all around. There are so many other kinds of foods in the world…. quit thinking that you have to replace or find substitutes for all the wheat filled foods! Sure, I like to use Cup4Cup and make cornbread ever so often…. cupcakes sometimes….. but most of the time I don’t need to use flour replacements…. I just don’t need the flour at all. Or bread crumbs! Honestly, I never used bread crumbs much anyway…. If a recipe calls for breadcrumbs/crackers as a topping I’ll use crushed cornflakes now, but I just never felt the need to add useless fillers to my food. When Brian first introduced me to Salmon Cakes (I’d never had them before) he used seasoned bread crumbs. So when I started making them for us I kept experimenting…. bread crumbs were gone, eggs and different seasonings came and went and reappeared…. I wasn’t getting super results. I often ended up with crumbly, dry Salmon Cakes. One day when I was making Dill-icious Chicken Bites it occurred to me that the Dill Dip would be just perfect in the Salmon Cakes too. I am so hooked on Wildtree’s Dill Dip Blend! I really hadn’t expected to really care for it… I’m just not big on dip…. but I’m finding so many other uses for the Dill Dip and I’m just loving it! In a small bowl, combine mayonaise, sour cream and Dill Dip Blend. Using just enough grapeseed oil to cover the bottom of your skillet, (we’re talking a thin coating so that the cakes don’t stick… not a layer for frying….think tablespoons….) heat the oil and then add the salmon cakes. Cook 2-3 minutes on each side, covering the pan while they’re cooking. Serve topped with a dollop of the remaining Dill Dip. Yum! Most times, I’m perfectly happy with our Cauliflower Pizza…. but sometimes I just want a real pizza. One that tastes and feels like pizza. We have tried a number of frozen and prepackaged gluten-free crusts, but most have that grainy/sandy texture common in gluten-free replacements. There are a few restaurants that we’ve visited that make a good gluten free pizza crust, but many seem to buy their crusts from the same place. They’re okay…. but they still have that obvious gluten free texture. PI Pizzeria makes a killer gluten free pizza, but they’re a bit of a drive for us. Brian began experimenting with our new favorite gluten free flour replacement, Cup4Cup. Cup4Cup behaves like regular flour and doesn’t have that grainy texture of many gf flours. So far I’ve been able to use Cup4Cup in a number of recipes without mishap. It isn’t as inexpensive as regular flour, but since we don’t make a lot of our old flour filled recipes anymore it balances out. Normally when I write these recipes I tell you that you can use your favorite spices or oils… that you don’t have to use the Wildtree products that I suggest… that they’re just suggestions. Well, for this recipe, I’m going to strongly suggest using the Wildtree Roasted Garlic Grapeseed Oil. Practically insist. It’s only two teaspoons, but the flavor really comes through in the crust. Oh! And the smell as it bakes.. OMG. Trust me. Invest in the Roasted Garlic Grapeseed oil. There are a ton of uses and you will never regret the purchase. Brian says I should mention his technique for pressing out the dough as well. First plop the dough in the center of a greased pizza pan. Next, using the edge of your hand and a rolling motion, press the dough to the edges of the pan. It will be very thin, almost see-through. Bake the crust for ten minutes. It will have large cracks and be slightly browned on the top. Next top the crust will all the yummy, delicious pizza toppings you adore. 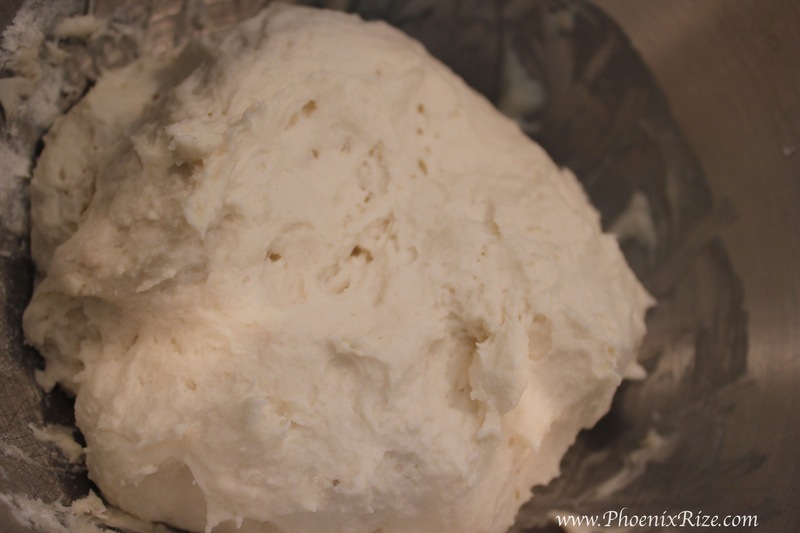 In a stand mixer, using the paddle attachment, combine water, honey and yeast. Let bloom, 5-10 minutes. Add oil, salt and flour, stir until combined. The dough should not be too sticky or too dry. (Think: slightly gummy, but not sticking to your fingers.) Cover and let rise 20 – 30 minutes. Lightly grease a pizza pan with olive oil. Place dough in the center of the pizza pan and using the side of your hand (see photos) gently press the dough to the edges of pan. Curst will be very thin, almost see-through. 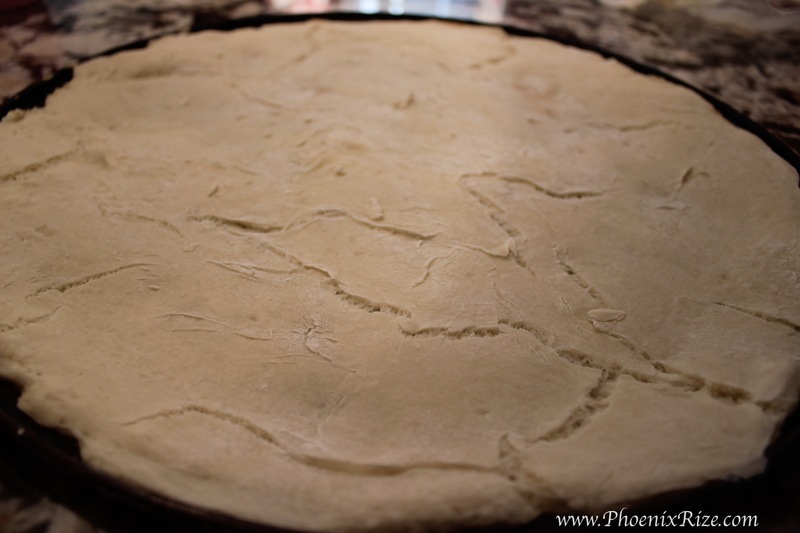 Bake pizza crust for 10 minutes. Top crust with sauce, cheese and toppings. Bake for another 10 minutes or until cheese is golden and bubbly. We’ve had some crazy busy weeks lately and I don’t see things slowing down until late September… (hopefully). Since I’m not always sure when Brian or I will be getting home each evening, I’ve been using the crock-pot a lot lately. As I’ve admitted before… I’m a little freaked out by crock-pots. I just don’t trust them not to burst into flames and burn down the countryside…. Brian thinks I’m ridiculous. Before we got married he lived off of crock-pot meals. He swears that crock-pots are perfectly safe….. I’m not entirely convinced….I still clear everything off the counter before using the crock-pot, but I have to admit it is really nice to come home to the smell of a delicious dinner. So the other day when I stopped at the fruit stand and they had a huge pile of beautiful, green peppers…. I swear I heard Grandma’s voice… It’s moments like these that I miss Grandma horribly and then feel so blessed to have had the time that we did. In my family, Stuffed Peppers are either loved or hated… there is no in-between. My Aunt Sheila and I love them… so when Grandma would make Stuffed Peppers Sheila and I would get a call to come over for dinner. I have lied and told Grandma that I hadn’t made dinner yet… taken dinner out of the oven and gone to Grandma’s for Stuffed Peppers. Of course, Grandma has passed, I’ve gone Gluten Free and Sheila has turned vegetarian (and almost gluten-free)….. things have changed, but that doesn’t mean I can’t have my beloved Stuffed Peppers… they just have to change a little too. Brian was lucky enough to have had Grandma’s Stuffed Peppers a time or two… I’m not sure if he was as excited about the Peppers as I was or if it was the mashed potatoes that he loved so much. 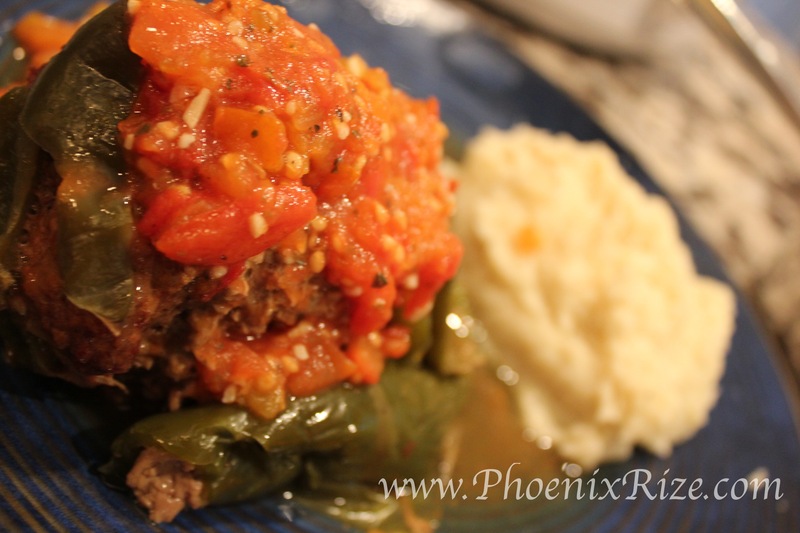 Grandma always made mashed potatoes with stuffed peppers… I’m not sure why, considering that we topped the peppers with a tomato sauce….. but it just worked. I always think of Stuffed Peppers as an Autumn type meal, but summer is really the prime time for garden fresh peppers and tomatoes. I had a bunch of tomatoes from my garden that I needed to do something with….. I don’t know why I plant them. I always end up with more tomatoes than I know what to do with, but every spring I am compelled to buy tomato plants. I decided to make my own homemade spaghetti sauce using Wildtree’s Hearty Spaghetti Sauce seasonings. OMG! It was sooooo good! I make a few changes from Grandma’s original recipe. I add pork sausage, where Grandma just used hamburger… I often use turkey instead of hamburger too. I also use Wildtree’s Garam Masala Blend… it sounds a little odd, (Ingredients: Organic Cinnamon, Organic Cardamom, Organic Cumin, Organic Coriander, Organic Black Pepper, Organic Cayenne Pepper, Organic Nutmeg, Organic Cloves, Organic Turmeric) but the flavors go together just perfect. Mix all ingredients together; roll into balls and stuff into the peppers. Bake at 350* for 1 ½ hours. Or place in a crock pot and cook on low for 6-8 hours. If you use the crock pot you could add the spaghetti sauce to the crockpot and allow it to cook with the peppers all day. After our Wildtree Launch Parties we had a a few leftovers… not much, but enough to play with and create an interesting, easy dinner for ourselves the following day. At first, I thought I was just being good and using up leftovers…. Nope…. I was creating our new favorite dinner! I thawed out a few chicken tenders and some spaghetti squash (yes, I freeze leftover spaghetti squash… it turns out just fine.) and got to cooking. Brian says this is his second favorite meal. Woo hoo! Good thing too, because we had it twice in one week because it is one of my favorites too! Best of all, it is pretty Low Carb (just the corn-flakes are naughty) and Gluten Free. Now, don’t just open a jar of spaghetti sauce and call it done. You will be missing out! I used to be a spaghetti sauce in a jar kind of girl too. I never saw a problem with it….. tasted fine to me…. until I tried the Wildtree Hearty Spaghetti Sauce Blend. I’m telling you…. this stuff is delicious! Aside from the awesome taste, the other huge bonus to using the Wildtree blend is that you can cut the recipe down to a proper size for your family. When I’m doing a Family Dinner night, I use a 28oz can of crushed tomatoes. When it’s just me and Brian, I can use the smaller can and half the amount of spice….. no more half empty jar of sauce in the fridge. Yay! In a small sauce pan combine the Hearty Spaghetti Sauce Blend and the whole can of crushed tomatoes. Let the sauce simmer while you work on the chicken. In a medium sized bowl, combine the mayonnaise (I used Miracle Whip), Sour Cream and Dill Dip Blend. In a second medium sized bowl crush the cornflakes into small pieces. Spray olive oil on the bottom of a 13 x 9 inch pan or baking sheet. Slice the thawed chicken into bite sized chunks (Mine were fairly healthy chunks… two-bite, bite sized). Coat each chunk in the Dill Dip and then roll in the crushed corn flakes. Place coated chunks in/on your pan. Repeat until all the chunks are coated. Bake at 350° for 15 – 20 minutes. 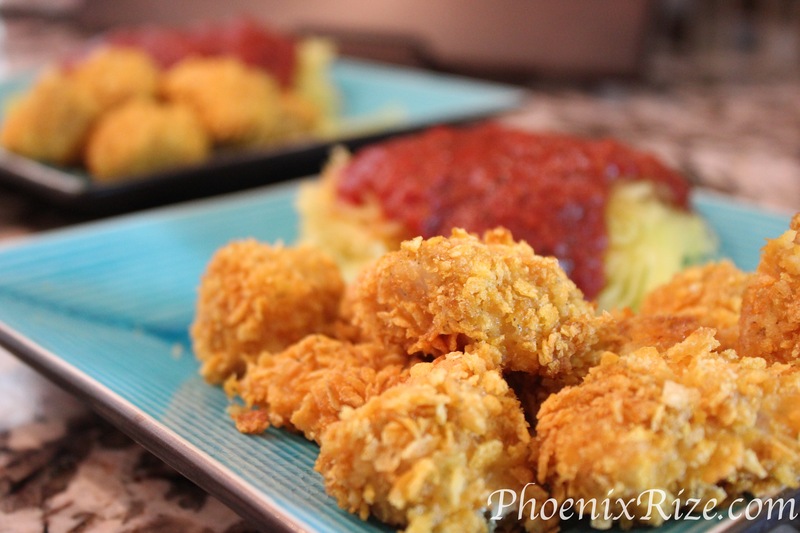 Combine the squash, chicken bites and sauce to your preference (I like to dip the bites into the sauce…) and enjoy!